I sat with an owner this week and watched his face crumple in frustration. This is a smart man. He works hard and has for a long time. His people matter to him and yet, success, for him, like a lot of owners, has become it’s own kind of problem. They got big. Now they’re seeing people leave. They care about protecting people’s freedom. They don’t want to micromanage. But people feel overworked and they complain about not having any support. They have built some good systems for getting work done. People don’t always use them. He's dealing with a lot of problems that he feels like he should be able to solve. He's dealing with problems he thinks maybe shouldn't be problems at all. Owner starts or inherits a company. Owner and top people see each other all the time. They each know what the others know. They pass information back and forth constantly. It’s fairly easy to make decisions and spread the word once a decision has been made. Now there are more people and it’s harder to stay on top of everything. The owner doesn’t see as many of his people as often. He and the other leaders don’t have the same information. It’s harder to make decisions. The team has good ideas but a lot of times they don’t actually get them done. They have more people that have less experience. The company doesn’t provide great training. They don’t have clear standards or expectations. People make mistakes. There are more fires to fight and people spend more time fighting them. Everyone is SO busy that it’s hard to get ahead of issues. Which leads to more fires. There’s confusion and that leads to conflict. don’t exist, don’t work, and make everything harder than it has to be. If you’re a) frustrated or b) wondering where the hell all your profit has gone, odds are your management structures don’t work or don’t exist at all. DATA/GATHERING INFORMATION: If you used to see everyone all the time you could gather data informally, in passing. 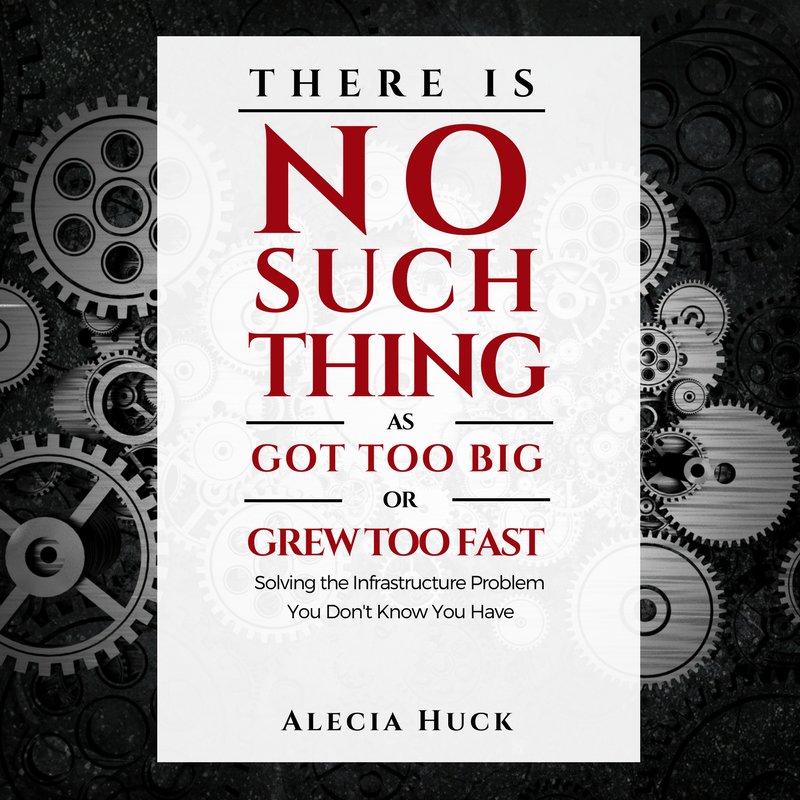 If you grow and don’t create a new way to efficiently gather data, you won’t get that same information. 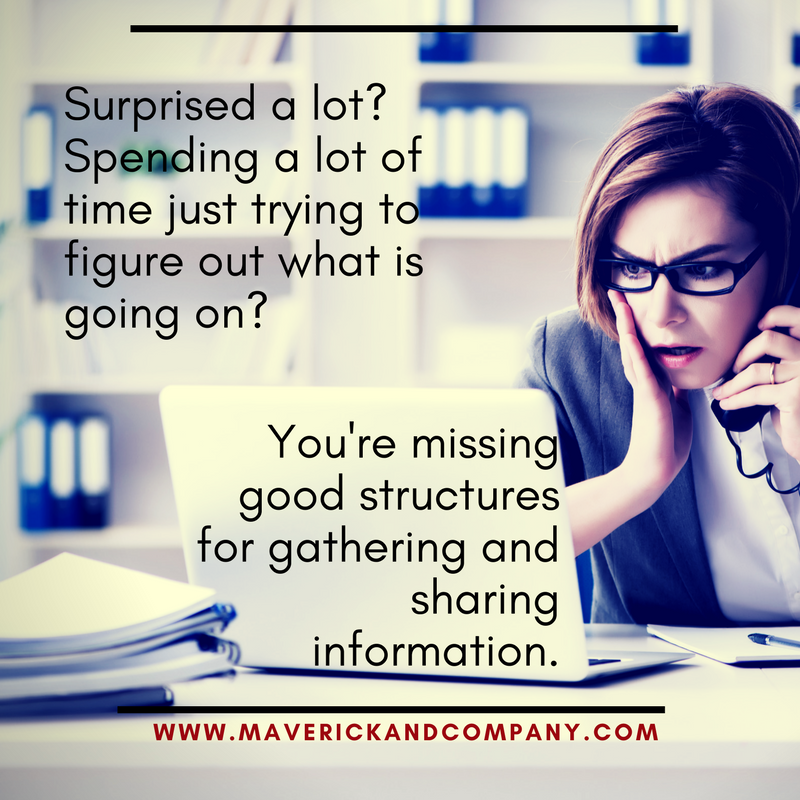 If you spend a lot of time just trying to figure out what is going on, if you are frequently surprised by things you feel like you should have known about, odds are you're missing structures to efficiently gather and relay information. A report doesn’t have to be a 20 hour, 63 page nightmare. A really simple, one page document with 5 bullets can be a report. You can even have a report be a quick voicemail where someone calls and proactively updates you on 3 specific things. The point is that you define WHAT information should be covered and create a standard and agreement about HOW and WHEN it will be delivered, WHO is responsible for delivering it. REGULAR MEETINGS: A lot of organizations manage things by proximity. You handle things as you see people (because you see them all the time) and as they come up. With growth you end up with more people and more stuff. Regular meetings give you one place to coral a whole bunch of non-urgent issues and questions. It can save you from a thousand little emails or quick questions during the week. Think about what information you need to get and give, and what discussions you need to have on a regular basis. The point is that structure doesn’t have to be a bad word. Creating a standard doesn’t mean you can’t override it to take care of your people or your customers. Having rules doesn’t mean you can’t break them in order to do the right thing. Build the management structures you need to have the company you want. Newer PostBad People or Bad Management?